This project is in rue de Siene in the 6th of Paris and the client is Laurent Taieb the famous Parisian restauranteur. It includes the kitchen, bedroom, bathroom and reception. Lot's of gold leaf, patine and faux pierre. 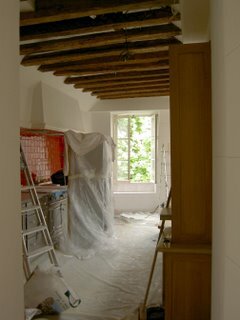 I'm working with Francoise this time and we are starting with the kitchen, giving it the atmosphere of an old chateau using faux pierre (fake stone) in relief on the walls. It's kind of a double cheat as it really is an old chateau but the previous owners modernised it so this brings it back to something of it's previous state. It's a lovely apartment and huge, taking up the second floor of a chateau which hides behind large stone walls and a massive gate in the centre of Paris. Laurent is a nice guy and it's surprising how much respect he gives everyone that works with him. He's very chatty but forcefull. Not the shy type. The rest of the apartment is being worked on by carpenters and electricians and we come in after they move to another room. Everything is done with military precision.